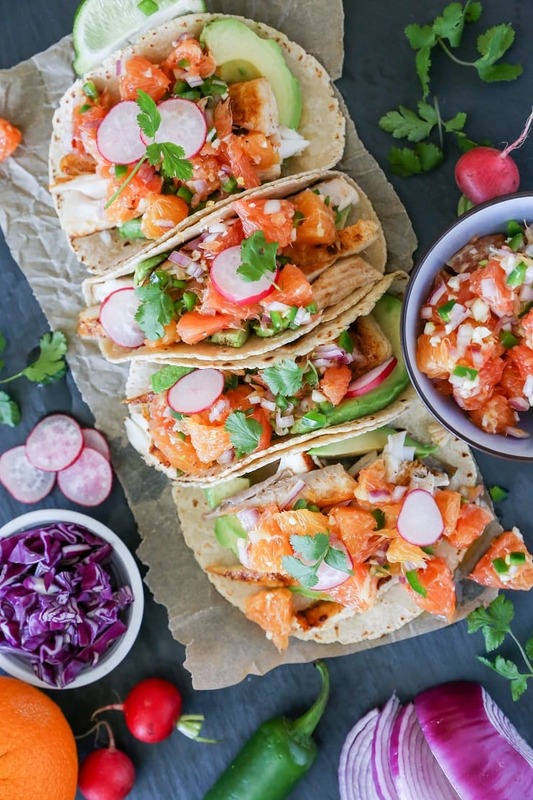 Pan-seared halibut tacos with fresh and flavorful cara cara orange salsa. 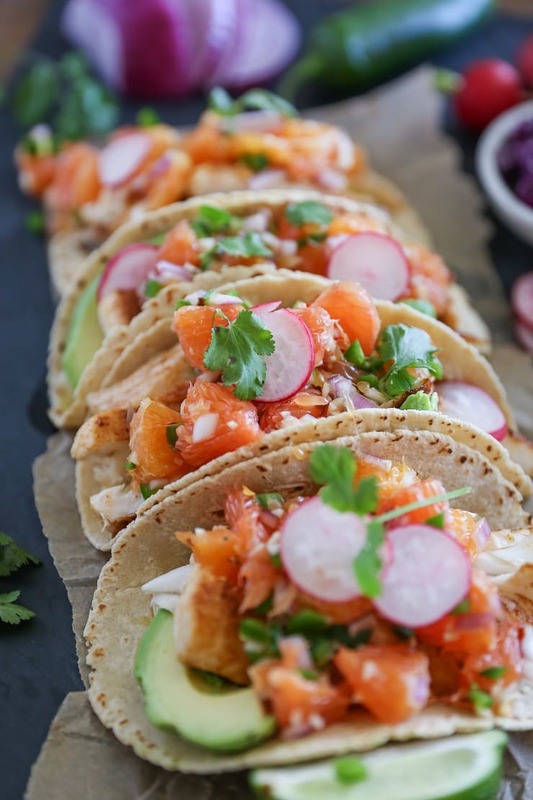 Fish tacos are a quick, healthful, flavorful meal that’s easy to whip up any night of the week! This post is sponsored by Harry & David. What is it about tacos that makes them such a party to prepare? Is it the variety of ingredients coming together into multiple small, perfect packages? The vibrant colors or plethora of smells permeating throughout the kitchen? The fact that every single ingredient is tasty on its own, but when swaddled in a warm, comforting tortilla (that happens to be a pure delight to hold) transforms into euphoric, almost fantastical food experience? Whatever it is, there’s something about making tacos that instantly creates a fun atmosphere. It’s like you couldn’t possibly be mad while making tacos. Now that I think about it, we should just make tacos every day. No one would ever be angry! Zen and the art of taco maintenance <-am I right? One of my fondest set of memories from back in my college days is the impromptu taco feasts my roommates and I would throw. 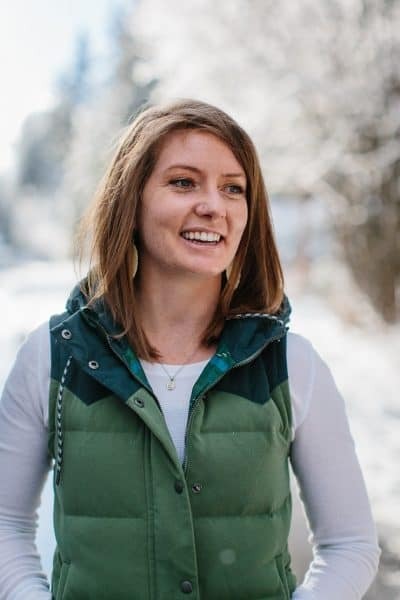 One (or all) of us would acquire a massive taco hankering (often breakup-induced), and we’d rush to the store, cook up a maelstrom of meat, and have toppings galore spread across the kitchen counter. That was back in my 4-taco days when I could down fully loaded taco after fully loaded taco like they were drops in a bucket, because when you’re in your early twenties, tacos are basically appetizers. It was also when I never thought to make my own salsa because 1.) in my inexperienced mind, salsa was one of those things you couldn’t possibly make homemade, and 2.) in our peripheral of priorities, salsa prep would have required way too much time. 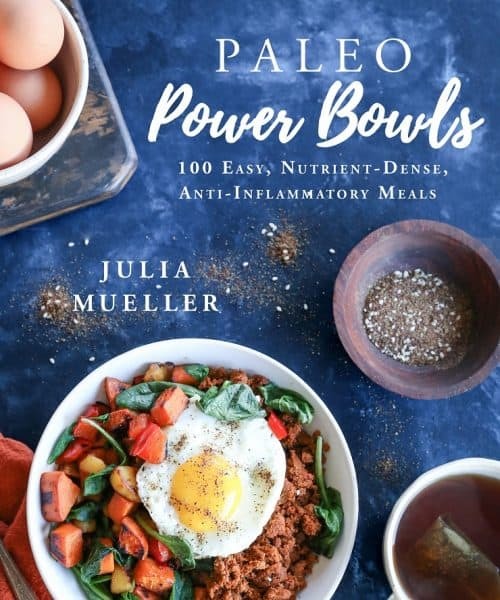 Fast forward to the current day, and I love using any and all varieties of animal protein (or even just straight up grilled or roasted veggies), and enjoy the process of making salsa – turns out, it only takes about 10 minutes…I can easily fit that in my peripheral of priorities. My all-time favorite salsa ingredient? Fresh, seasonal fruit. Harry & David graciously set me up with their Signature Classic Fruit-of-the-Month Club® Collection, wherein I receive a beautiful box of fresh fruit each month. 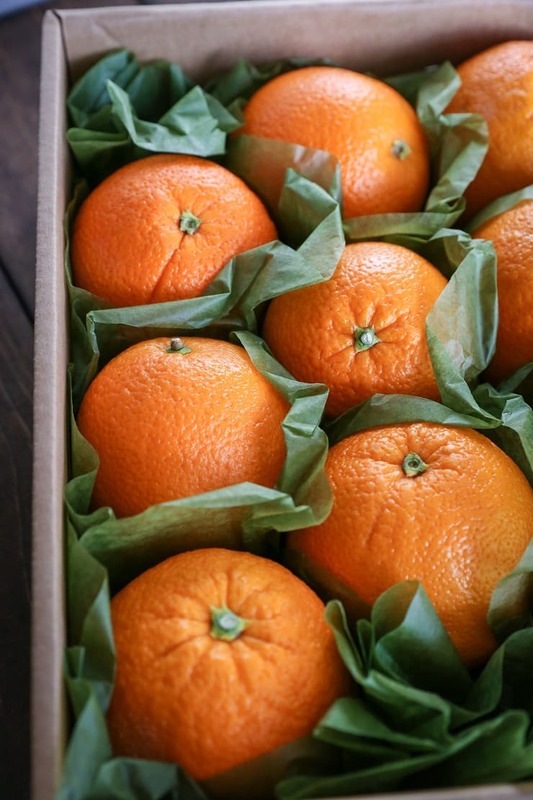 I was delighted to receive these gorgeous cara cara oranges in my first shipment. I’m sure you’re familiar with the concept behind Harry & David’s monthly fruit subscription program, but I encourage you to look more into it – there really is nothing like having a thoughtfully wrapped box of perfect fruit arrive at your doorstep! If you’re new to cara cara oranges, here’s the skinny: cara cara oranges are a cross between two navel oranges. They look almost identical to navel oranges on the outside (I certainly wouldn’t be able to tell them apart), but when you peel them or cut into them, you’ll notice the flesh is pinkish red rather than orange. They almost look like grapefruit on the inside. They taste super sweet, yet have the most marvelous citrusy tang. After ravenously consuming a few oranges, I set out to use them in some recipes. 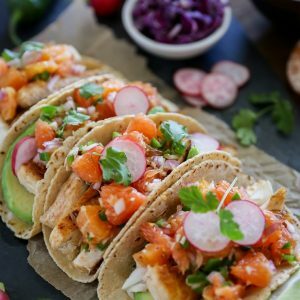 I used a couple of the cara cara oranges in this super simple, easy citrusy orange salsa as the topping for these fresh fish tacos. The salsa creates the most magnificent perfect bite experience…that you get to enjoy bite after bite. At first, I thought these tacos would need some sort of sour cream based sauce to go on top..you know, like a chipotle crema sort of situation? Nay. They need no sauce, as they’re so fresh and tasty as is! As a side note, guess where I sourced the halibut? It was part of the fresh catch Garrett and I harvested over the summer in Alaska. There really is nothing like knowing exactly where your food comes from, and these tacos were extra fun for me to prepare for that reason. So! Taco preparation? I took two halibut fillets, drizzled them with olive oil and sprinkled some seasoning on them. I allowed them to marinate like this in the refrigerator for about an hour, but you can easily skip the marination process if you’re under a time crunch. I tossed together the orange salsa, seared the halibut up on a cast iron skillet and badda bing badda boom, dinner was made! I did take the time to remove the membrane around the oranges, which I think helps create that melt-in-your mouth experience when you sink your teeth into the taco, but if you’re under a time crunch, the salsa will still be delicious if you don’t peel off the membrane. Be sure to check out Harry & David’s Fruit of the Month Club! Keep Calm and Taco On <-don’t fight me on this. Add all of the ingredients for the orange salsa to a bowl and stir well. Set aside until ready to use. Drizzle the fish with about 1 tablespoon of olive oil and use your hands to smear it over the full surface of the fish. In a small bowl, stir together the seasonings and sea salt. Sprinkle the seasoning mixture over the fish (it's okay if you don't use all of it). If marinating for a long period of time, place fish in a zip lock bag and refrigerate until ready to cook. Add the remaining olive oil (to a cast iron skillet and heat to medium-high. Once the skillet it fully hot, place the fish on it, skin-side up. Cook 3 to 5 minutes, or until golden-brown and crispy. Flip and cook an additional 3 to 5 minutes, or until the fish is cooked through. (If using white fish, you can tell the fish is fully cooked when it's opaque, or the internal temperature reaches 145 degrees F). 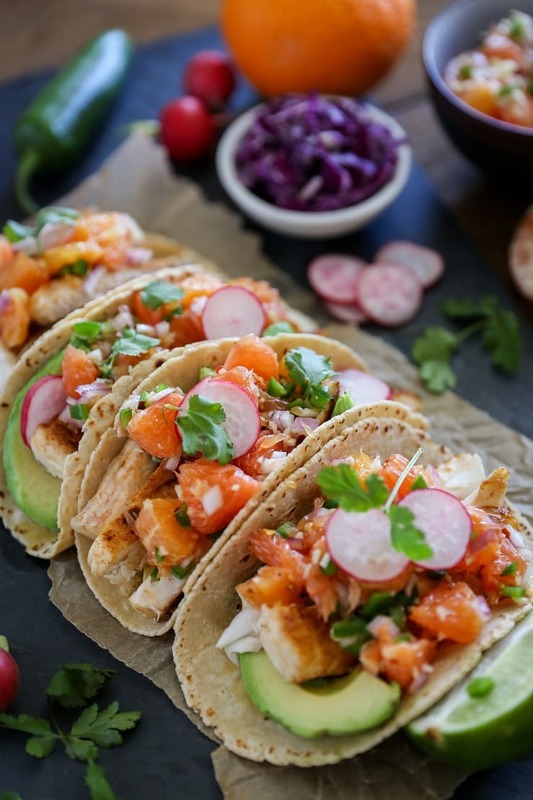 Heat the tortillas and load them up with desired amount of avocado slices, fish and orange salsa. Top with sliced radishes and fresh cilantro, and serve! What a great spring recipe! Harry and David send the most amazing fruit. We will have to make these tacos this weekend! I hear ya! Every time I make tacos, I ask myself why I don’t make them more frequently. So happy you like the orange salsa! I’ve never made salsa with oranges but it’s a great idea. I love cara cara oranges and think they have the most flavor. Love this idea! 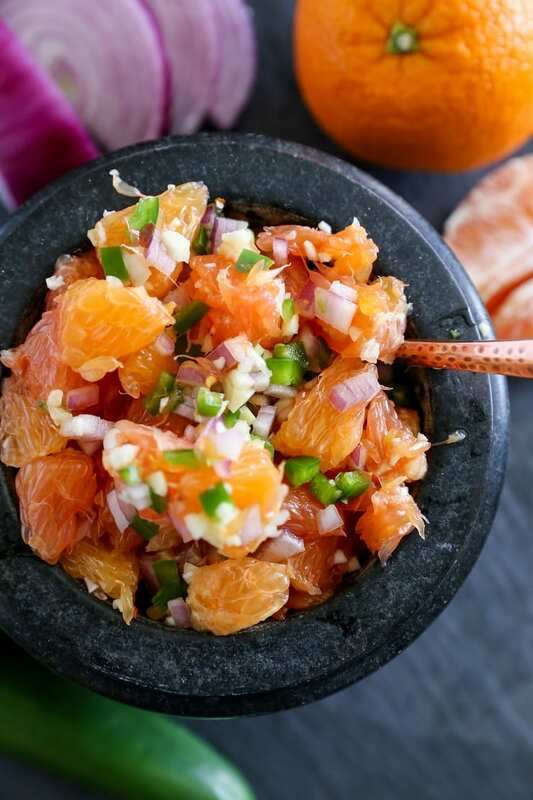 What a fantastic idea… I’ve never made a salsa with citrus before! These look beautiful! Thank you so much!!! did it and it’s so tasty!!! Orange salsa sounds delicious! These tacos look so fresh and tasty! These were delicious! I love cara caras, but have never used them in a salsa. What a great idea! Yum — I’m going to make a bunch of these and then freeze them for lunches. I was surprised when I first tasted fish tacos when I visited California, but now they’re among my favorite. I think I might throw in some cocktail shrimp too.